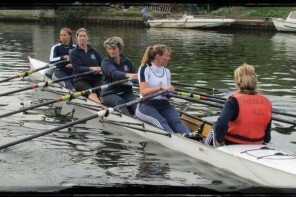 Henley Rowing Club had five entries at this year’s Henley Women’s Regatta. Congratulations to all our junior competitors, to the coaches, helpers and all parents/guardians for their support. Junior coxed four Grace Johnson, Daisy Butterworth, Mary Wright, Phoebe Fletcher and cox Ella Nolson. For the J16 crews the regatta started Friday evening with qualifying time trials. For the coxed four this meant being in the top 8 out of 17 crews and for the quad in the top 8 out of 15 crews both crews progressed through to the side by side racing. For the J16 four this meant a first round race against Emanuel School. 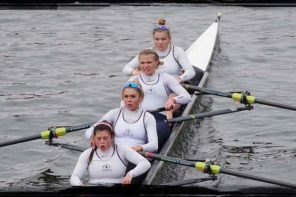 This was a fiercely fought race with Emanuel taking any early lead, Henley rowing through them at halfway only to see Emanuel regain the lead in the last few hundred metres to end the Henley girls’ hopes of progressing in the regatta. 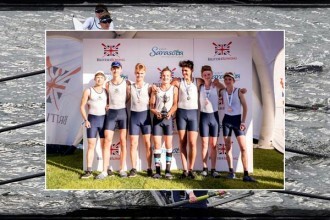 The J16 quad drew Canford School first round and had a comfortable 4 ½ length victory. In the semi final on Sunday morning they overcame Surbiton High School with a 2 ½ length victory to take them to the final. The final saw them meeting local rivals Marlow. This was closely fought with Henley edging a lead to get out to about a length but never quite shaking Marlow off and Marlow pushing back in the last few hundred metres to reduce the Henley winning margin to ½ a length. In the Junior events (under 18) racing started with time trials on Saturday morning. The four having to qualify 16 out of 18 the quad 16 out of 25 and the single 16 out of 17. All three crews qualified. Maddie Pollard in her single had a first round victory against Lindo of Twickenham Rowing club but in the second round came up against the favourite and eventual winner Pooley of Agecroft. The Coxed four had a comfortable first round victory of 4 ½ lengths against Sir William Borlase’s School and an even more comfortable second round victory over Marlow who did not make it to the start having being disqualified for illegal substitutions. The semi final saw them put in a good performance against Headington School to secure a place in the final against Putney High School. 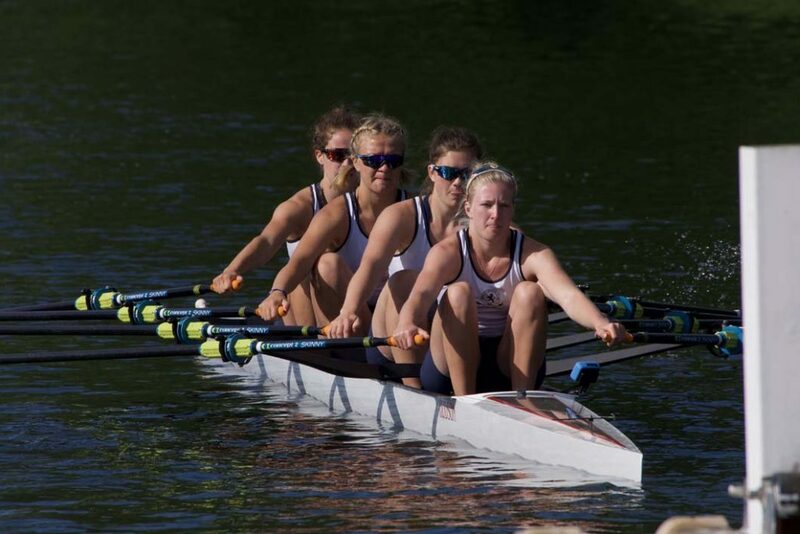 In their semi final Putney had beaten Lower Merion High School from the USA by half a length. The final saw Putney getting a early lead which they built on throughout the race, though without ever shaking the Henley girls off , but where able to maintain it to win by ¾ length. The Junior quad had perhaps not had the best preparation for this event with Sophia Hahn only arriving back in the UK on Friday having spent time trialling for the American junior team back in the USA. Saturday afternoon saw them have a comfortable victory over Shrewsbury School, but a bit off a scare first thing Sunday morning against Latymer B with Henley hitting the booms to let Latymer take the lead which Henley did not recover until the Barrier but continued to then move away to win by 1 ¼ Lengths. Semi Final against Headington saw the old rivalries bringing out the best in both crews Henley getting off to a flying start to take an early lead which they built on to win by 1 ½ lengths but never quite getting away from Headington. The final saw Henley up against Latymer A. This was a very good race Henley nudging an early lead but Latymer pushing back at them all the time and the crews overlapping throughout the race with Henley taking the victory by just ¾ of a length.